I'm rather new at the site and think I make some progress now and then how to use and participate. 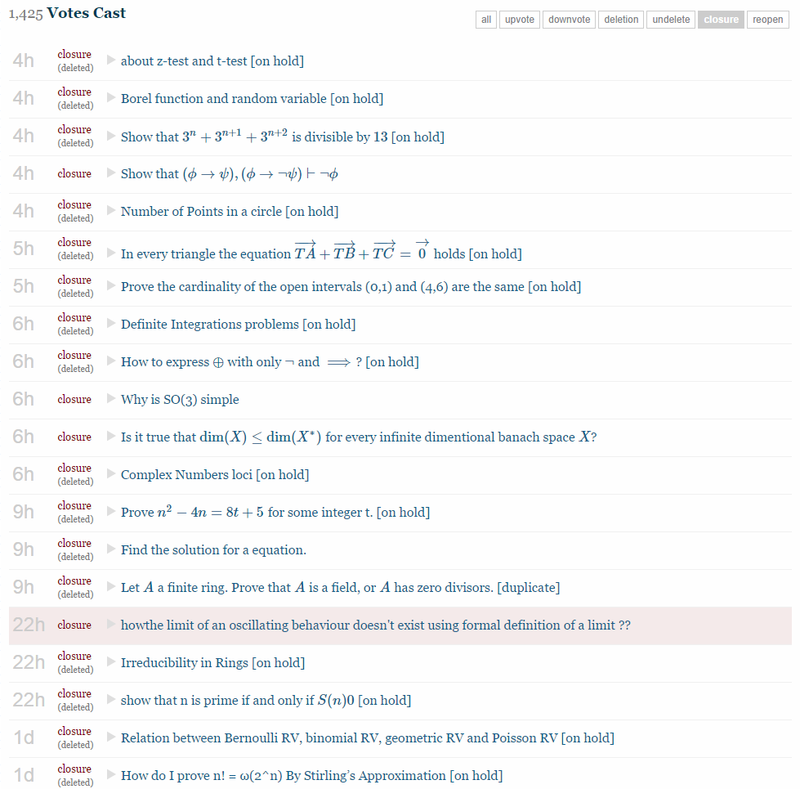 Some of my contributions are real bad, I surely admit, as for example https://math.stackexchange.com/questions/950958/a-simple-set-theory, that seems to be the result of a blackout, and I really don't care if the community vote for closing that question. But now some users want to close a reasonable question of mine with a good and accepted answer and I can't even guess any fair reason: https://math.stackexchange.com/questions/953716/how-to-express-oplus-with-only-neg-and-implies. So what is this? I really don't care if the question will be closed and deleted, since I got the answer and the question isn't very interesting, but somehow it feels that some persons vote to close with obscure motives. Or have I missed something totally? So it has been closed with the motivation "This question is missing context or other details" which is not true. There are no missing context or details in the question. But since no one will answer, apparently, I'll guess one have to live with the annoying fact that users amuses them self by closing others questions instead of ask questions of their own. As someone who reviewed the Question and narrowly decided against voting to close it, perhaps I'm can give some constructive suggestions on what needs to be improved. Note: $\wedge$ is not allowed! It's enough that you ask to express XOR in terms of NOT and IMPLIES. This in itself is fairly easily done, which makes many Readers suspect that if you'd only give the problem a bit more thought, you would find the expression for yourself. The subject matter is okay, but the redundant (and imperative) injunction not to use AND makes this Reader suspect that you simply don't understand the Question that you are asking. How will you know if you get an Answer, whether it is correct or not, if you've asked something that you can't even define? I don't know if that's the case here, but I'm saying the lack of context and "almost rude" presentation of the problem raise the suspicion. So -- for the to-do list to Edit the Question and perhaps get it reopened, work on being less imperious and more generous with sharing what you do understand about the Question. This is quite general advice, but it should pay dividends in motivating your Readers to respond with thoughtful Answers.